7-year-Old Shajah is suffering from cancer. Saleem from Kasaragod used to work in a shop. He left his work to take care of his 7-year-old son, Shajah who is diagnosed with cancer. His family of 5 were in for a shock when they found out their little son has cancer. Shajah has an elder brother and a younger sister. 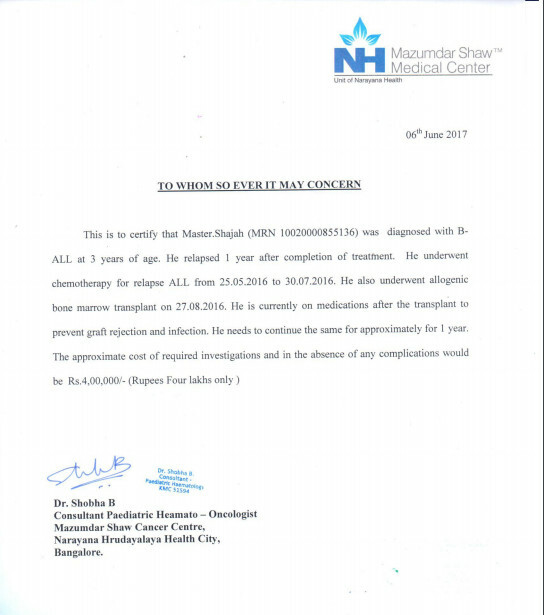 Shajah underwent chemotherapy in a hospital in Mangalore in 2015. It was with much difficulty that the family arranged for funds, borrowing from relatives and friends. Shajah was cured of his cancer. The family’s prayers were answered and Shajah’s life was returning to normal. But the family was in for another shock when doctors informed that the little one’s cancer has relapsed. Now Shajah needs to undergo a bone marrow transplant to be free from cancer. His Father Was the Only Bread Winner. Over 6 lakhs was spent for his chemotherapy in 2015. 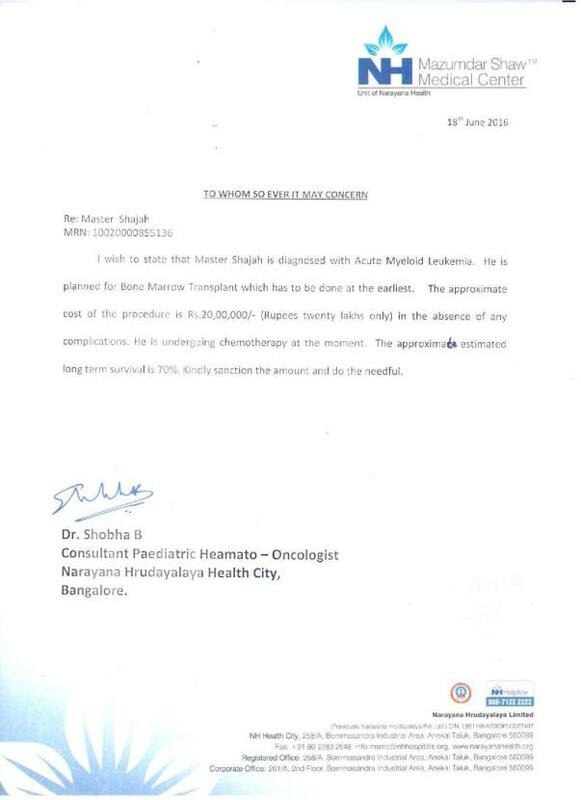 Now the transplant will cost nearly 20 lakhs and this is a huge amount for the family. The monthly spend is Rs.10,000. Shajah is presently being treated for chronic lung GvHD. His health is also stable..
We are glad to let you know that Shajah's health is improving day by day. His recent test reports show that there is a good prognosis. Shajah and his family have come a long way and become even more courageous with their experience. The doctors strongly recommend that it's very important for him to continue his follow up and go through regular check-up and supportive medication to improve his health further and get back to his old self. We request you all to share his story with your friends to encourage more people to support Shajah for his follow-up care. Let's once again do our best to help this little warrior. Thank you for all the love and support that you have shown towards Shajah. Shajah has completed the treatment and is currently under follow up. He and his family have gone back to their native to be with the rest of the family. This would be a good change for Shajah who has been seeing only our medical team for the past few months. They visit the hospital every 2 weeks for the follow up with the doctors. It would take some more time for him to get back to his old self. Requesting you all to keep him in your prayers for a fast recovery, to get back to his normal life and go back to school.